Fifa president Sepp Blatter is appealing against his 90-day ban from football's world governing body. Blatter has been suspended while Fifa's ethics committee investigates corruption claims against him. The 79-year-old Swiss was suspended on Thursday along with secretary general Jerome Valcke and vice-president Michel Platini. All three deny wrongdoing. Fifa will hold an emergency meeting on 20 October in Zurich to discuss February's presidential election. Platini, the English Football Association's preferred candidate in the election to replace Blatter, will contest the ban "in the appropriate manner at the appropriate time". 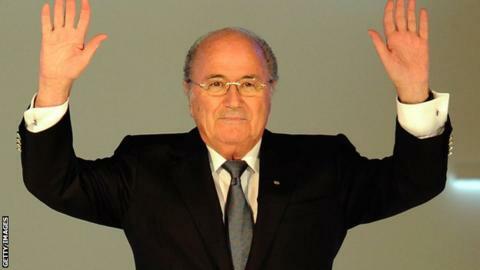 Klaus Stohlker, Blatter's friend and adviser, said: "He has appealed already to Fifa's appeal committee. He is defending his position and he is sure that he will be found not guilty." Blatter's lawyers also confirmed they were seeking to overturn his ban. However, some have questioned Blatter's desire to stay in charge. Former Football Association chairman David Bernstein told the BBC: "Blatter is a fool to himself to stay on for so long." The FA had pressed Fifa to hold the emergency meeting of the governing body's executive committee to discuss its elections. David Gill, a Fifa vice-president and the vice-chairman of the FA, had also written to Markus Kattner, Fifa's acting secretary general, with a similar request. African football confederation chief Issa Hayatou, Fifa's longest-serving vice-president, is heading the organisation in Blatter's enforced absence. Fifa's ethics committee began its investigation into Blatter after the Swiss attorney general opened criminal proceedings against him in September. The ethics committee also opened an inquiry into Platini over the 2m euros (£1.35m) payment, which was made nine years after the 60-year-old Frenchman carried out consultation work for Blatter. Valcke was already on gardening leave from his Fifa post following newspaper allegations last month which implicated the 55-year-old in a scheme to profit from the sale of World Cup tickets. Valcke's lawyer said that his client was "confident" he will be fully cleared of the "false allegations" when "all the facts come out". Blatter won a fifth consecutive presidential election in May, but he announced he would be stepping down just days later following the launch of two investigations into Fifa by United States and Swiss authorities. He is due to finish his term on 26 February, when a new president will be elected. Platini, who also heads European football body Uefa, is one of the favourites to replace him and still plans to stand. He has the full backing of Uefa, which is holding an emergency meeting next week. But FA chairman Greg Dyke says the English game's governing body will withdraw its support for the former France international midfielder if he is found to have "behaved dishonestly". South Korean Chung Mong-joon, a former Fifa vice-president, is another aiming to succeed Blatter. He has been banned from all football activity for six years by Fifa, but on Friday said he would appeal against the ban to the Court of Arbitration for Sport. He is also planning legal action against Fifa and Blatter. "Fifa is like the sinking Titanic," he added. Meanwhile, the European Club Association, which represents more than 200 clubs, has become the latest group to call for reform at Fifa. Citing its "concern over the developments at Fifa over the last few months", the ECA said in a statement it wanted more involvement in the running of the organisation.